A. 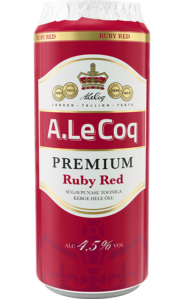 Le Coq Premium alcohol free beer retains the mellow flavour characteristic of Premium thanks to its special preparation. To produce the alcohol free beer, we use fermented beer from which we then extract the alcohol using the special vacuum evaporation method. Creating the vacuum allows the alcohol to be evaporated at a lower temperature, so the flavour of the beer doesn’t suffer in the process and the alcohol free beer retains the pleasant mellow flavour of Premium. Alcohol free A. 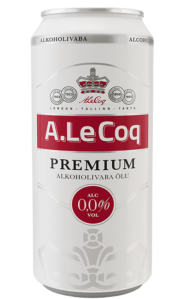 Le Coq Premium suits those who would like to reduce their alcohol consumption or those who have decided to cut out alcohol all together. Naturally, it is also the best option for beer drinkers at times when drinking alcohol is either not allowed or not possible. 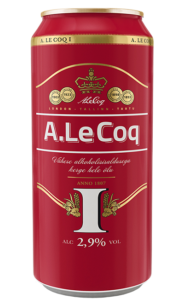 Alcohol free beer has fewer calories than conventional lagers, and therefore this beer is ideal if you are watching your weight. 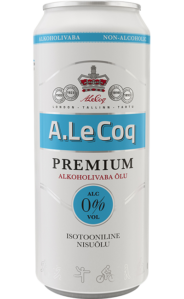 The 0.33l alcohol free Premium bottle contains just 87 kilocalories (26.3 kcal/100g). The B-vitamin content also makes alcohol free beer a suitable sports drink, which helps you recover after physical exercise. water, barley malt, barley, hops, hop extracts.